Reduced Fat Blend 60% (30% milk fat & 30% vegetable oil). Made from natural ingredients. Reduced fat blend of Lurpak butter, rapeseed oil and olive oil. Free from palm oil. From pressed rapeseed oil only. Contains no colourings, preservatives or other additives. Suitable for vegetarians. 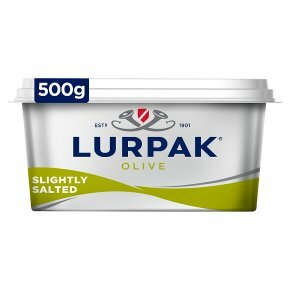 Kosher - D. To create Lurpak® Spreadable Olive Lighter, we blend pure Lurpak® butter with olive oil and rapeseed oil. Try it on your favourite fresh bread and top with whatever you fancy. Be inventive, see where the flavours take you.